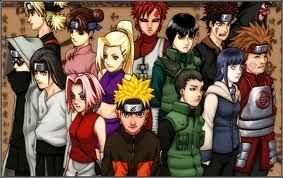 You are going to Watch Naruto Shippuden Episode 250 English subbed online free episodes with HQ / high quality. Stream Anime Naruto Shippuden Episode 250 Online English sub Battle in Paradise! Odd Beast vs. The Monster! The chakra of Kushina finally departs from Naruto’s psyche and Naruto promises himself that he will train hard and surpass all Hokages in pursuit of his dream to become the next Hokage. Naruto wakes up and activates his Nine Tails chakra mode, which allows him to sense negative energy from Samehada. As it turned out, Kisame used a decoy to take his place during the fight again A and Killer Bee while he hid within Samehada until the time is right. While taking Killer Bee’s chakra, Kisame escapes with the intent to inform Tobi of the Jinchurikis’ location. However, Kisame ends up facing Guy before being hit by the man’s Hidora attack.